This historic 1br/1ba cottage, originally constructed in the late 1800's has been eloquently renovated and furnished with modern conveniences and a contemporary feel. It is located in the Historic district. The unit features a spacious bedroom, a large luxury bathroom, a comfortable living area, a modern fully equipped kitchen, and a new indoor Samsung stackable washer and dryer. The condo has a modern white leather couch, a contemporary TV entertaining center, a white leather bed, and an office desk. The large bathroom has a very unique black granite counter top and basin, and a 2 person hot Jacuzzi tub, which is perfect for a romantic and relaxing evening. The unit also offers a private outdoor porch for a lovely breakfast morning-coffee or evening glass of wine. The porch overlooks a small backyard that connects to a privately shared swimming pool area with a grill, lounge reclining chairs, 2 tables and umbrellas. You're going to LOVE it! Perfect for honeymoon and anniversaries or just chilling out in Savannah for the weekend. This awesome condo is in a great location in the Landmark Historic District of beautiful downtown Savannah, GA. Walking distance to grocery stores, bars, fine dining, and world famous Forsyth Park make this an unbeatable location in this hideaway downtown area. . It is a block and a half away from a Kroger/Starbucks supermarket, 4 blocks from Forsyth park, 3 blocks from Mate Factor coffee shop, 5 blocks from Sentient Bean coffee shop and restaurant, 4 blocks from elegant restaurants and bars/rooftop, 6 blocks from Brighter Day, an organic/nature and healing supermarket and deli, 4 blocks from a massage spa, and more. It is basically a close walk to everything! An average of a 20 minute walk to the shopping district through the heart of Savannah's historic squares. Approximately a one mile walk that will provide you with a complete Savannah experience. Our condo is located in a quiet street away from the parking and noise hustle and bustle, yet close to coffee shops, restaurants, and Forsyth park. Also, a short 20-30 minute beautiful drive through Savannah's painteresque marsh to Tybee Island for a beach day. 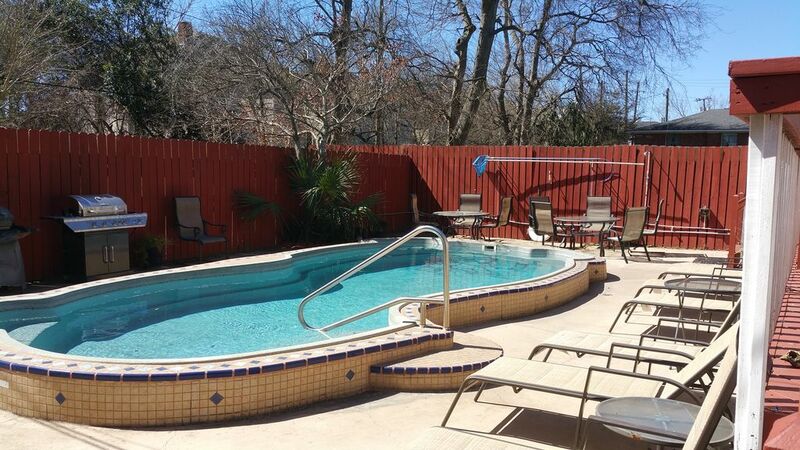 And... Did we mention there is a pool? ;) That is a rare treat in Downtown Savannah. This neighborhood is great because it is NOT in the fully tourist district of Savannah. You will see professionals, students, life ling residents, and daily commuters. It really gives you a taste of the live-ability of the town. It is a close walk to everything and really easy to get around. Savannah is a walking and biking town. This location is striking distance to everything Savannah has to offer without needing a car at all. We have a small area out back for secure bike parking. The town is best seen from foot, and I always reccomend walking. However, Uber and Lyft are in town as well (about $5 to downtown). Bicycle-taxis (pedicabs) are also avaialble if you need a quick boost and they work on tips. There is also DOT free trasnsportation 3 blocks away. Very eloquently decorated with high end fixtures, granite vanity top, black vessle sink, and 2 person jacuzzi bath tub. Ohhh-la la. Gorgeous pool steps from the back door. Jetted two person tub in bathroom. 3 C’s - comfortable, convenient, and clean! And there’s a pool! We met the owners David and Luciana and they couldn’t be nicer! They allowed us to check in early for a small fee and were very accommodating. We enjoyed our stay! Had a great time in this condo Super owners were always on hand to help. Loved the pool and more than enough parking!!! This cottage is a true jewel. Built in 1886, it has been renovated tastefully and artfully. The owners are accommodating and charming. Stepping in the front door felt like coming home after a long journey. We loved the red accent walls and the decor. The sofa is sinfully comfortable and we slept like babies on the bed. The rear door leads out to a back deck and the common pool area. It's rather unique in that several properties come together in the back. The pool was lovely to come home to on a hot day. This was our third stay in Savannah. We will definitely be looking to rent this home in the future. Savannah is a city rich in history. From the original squares laid out by General Oglethorpe to the anti-bellum homes spared by General Sherman during his fiery march to the sea, the character of Savannah as it was 150 years ago survives today providing a dramatic backdrop for tours and photo opportunities. From horse drawn carriages clodding along cobble stone streets to renting mopeds for zipping around squares, there is no wrong way to see the city. Shopping and art are abundant in downtown Savannah. Broughton Street boasts designers such as Marc Jacobs and the Jepson Art Museum draws international talent. There are also several prestigious galleries in the City Market area. Visit the plethora of lunch restaurants and coffee houses during the day and enjoy the bar districts of city market and river street in the evening. Or.......just get out of big city traffic for the week and relax by the pool.